The Eiffel Tower as photographed by Luigi in Mario is Missing! The Eiffel Tower (in French: La Tour Eiffel) is a famous structure located in Paris, France. Being one of the country's most famous landmarks, it appeared some times in the Mario franchise. 1.1.1 The Super Mario Bros. Super Show! 2.1 Pamphlet Information from Mario is Missing! 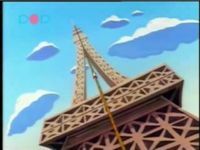 The Eiffel Tower is first briefly seen in The Super Mario Bros. Super Show! live-action segment "French". 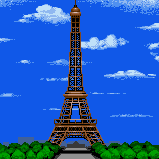 The Eiffel Tower as seen in The Adventures of Super Mario Bros. 3 episode "Super Koopa"
The Eiffel Tower later appears in The Adventures of Super Mario Bros. 3 episode "Super Koopa". Bowser, through the use of a Power Pendant, becomes Raccoon Koopa, allowing him to fly to the Eiffel Tower with Princess Toadstool, where he ties the princess up. Toad later arrives at the Eiffel Tower to save Princess Toadstool, so that she can assist Mario and Luigi as they fight against Bowser. Throughout the rest of the episode, the Eiffel Tower can be seen in the background. Mario is Missing! marks the tower's first and only appearance in a Mario game. Along with the Cathedral of Notre Dame and the Arc de Triomphe, the Eiffel Tower was one of the landmarks visited by Luigi when he came to save Paris from invading Koopa Troopas. During the events of the game, the French flag at the top of the tower, the Tricolor, was stolen by Troopas. Luigi had to find and return it, for which he was rewarded a regular prize of 1,400 dollars, plus a 2,000 dollar bonus if he returns it first. The tower that has come to symbolize Paris was designed by Gustave Eiffel, an engineer. The tower was built for the World's Fair of 1889. It is 1050 feet high and built entirely of steel. 2.5 million rivets hold it together. The Eiffel Tower has its own post office, and letters posted there will bear its impressive postmark. Once the tallest building in the world, it is now dwarfed by the Empire State Building and Chicago's Sears Tower. The Mario Party 3 minigame "Awful Tower" takes its name from the Eiffel Tower. Despite what happens in Mario is Missing, there's actually no flag on the top of the tower. The tower in the background of N64 Rainbow Road from Mario Kart 8 resembles Eiffel Tower. This page was last edited on August 17, 2018, at 23:02.